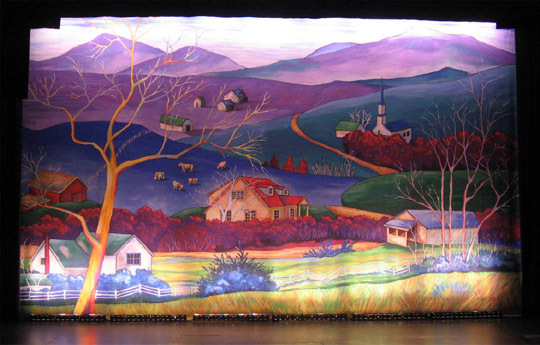 This little play was produced at The Children’s Theatre of Charlotte in December 2006. I designed the set and this backdrop is a favorite backdrop design for me. I have a small rendering for it that I did on a canvas board. I am thinking of framing it and making it into something I can hang in the gallery. ~ by Sandra Lynn Gray on February 10, 2008. Definitely do frame it! It’s gorgeous! that is soooooo gorgeous. It’s almost like it’s taken right out of the mind of a child. Amazing. Bravo! Bravo! this is the real backdrop about 30×40 feet. This is fascinating and a marvelous backdrop. Would be perfect in a children’s book – a really classy children’s book. I love the colors in it…you always use a brilliant pallet! I hope you figure out how to frame it. wow, this is amazingly gorgeous, love the lighting and colors. Thanks to all of you. I love your supportive comments. I have to admit it. That has been the best purpose for the blog…….a bit of communication and appreciation from some others for my work. Ankush, the credit for the lighting on the backdrop in this picture must go to a good friend and collabotator on many a show. As some of you know, my daughter is also a lighting designer, but she did not light this show. Lighting is so important to any displayed art but a theatre set loses all its magic without it. I really like your backdrops and I was wondering if you could lend us one? We are a small production company based in south east London and we are making this really cool music video which we want to give a Vaudeville feel to it. Your backdrops are really fantastic. Please let me know. We are planning on shooting next tuesday so it;s an urgent matter. your designs are unique, i love them, please post to my mail your designs.